You cant move forward until you learn to accept it. Being in a rush, might lead you to a wrong decision, but a wrong decision may be a good thing if you decide to accept it and do something to make it a good one. Moving on doesn't mean you forget about things. It just means you have to accept what's happened and continue living. Forgetting is accepting, you might not forget what that person did to you, but all you just need to do is to accept the fact that past is past and forget those hatreds in your heart. Let it be, if it's not meant to happen. Just anything. Move on from it. Just give it rest. It's not the end of the world for you. You have a chance to be you. So, just let things be. 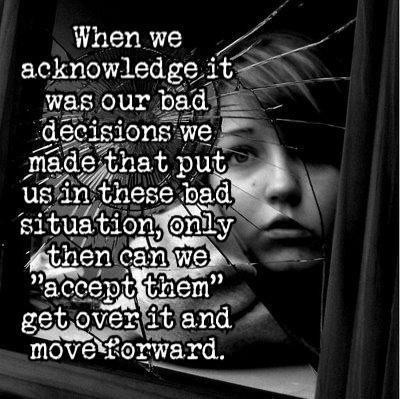 When we acknowledge it was our bad decisions we made that put us in these bad situation, only then can we accept them, get over it, and move forward. Acceptance, though a hard thing to do, is an essential thing that helps you to improve in life. When you accept a friend as such with his plus and minuses, you gain friendship. When you accept a past deed, you prepare yourself to face the future, when you accept a situation, you become more comfortable. Acceptance is the essence of life and if we try to shun away from acceptance, life becomes a bed of thorns. 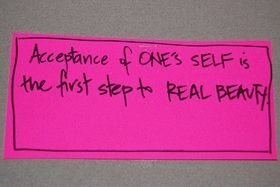 As K C Theisen said, acceptance is not submission; it is an acknowledgement of the facts of the situation. It also helps you to decide your future course of action. Those who accept things that cannot be changed are as wise as grass that grows in the riverbeds and those who refuse to accept are like trees there. When a storm blows, the grass accepts and survives but the tree falls to the power of the wind. Acceptance is an important character that we have to inculcate in us, to survive successfully in this world.